If humans attempt to see underwater, the image is blurred due to refractive differences in air and water that disrupt the normal refractive effect of the lens in the eye. A diving mask overcomes this issue. How then do frogs accommodate their lenses in both air and water? Are their images clear in water and blurry above, or vice versa? As far as I know, their lenses are made up of epithelial cells and fiber quite similar to the human eye lens, or am I incorrect here? Frogs are nearsighted on land and farsighted under water. Frogs are reported to be nearsighted on land, but farsighted underwater (source: Chegg Study). Nearsightedness (myopia) is a condition in which near objects are perceived clearly, but objects farther away are blurry. Farsightedness (hyperopia) is the reverse. The human counterparts of these conditions are shown in Fig. 1. 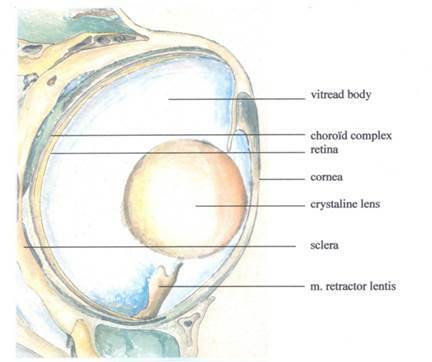 Humans focus images on the retina by changing the shape of the lens; to focus on near objects, light is more strongly refracted by making the lens more spherical in shape. For far-away objects the lens is flattened such that light is less refracted. In humans refractive errors are common and can usually be successfully treated with corrective lenses. The cornea adds substantial refraction to the optical system of the eye, namely about 43 diopters. As a comparison, normal prescription glasses often have only a few diopters worth. In water the refractive index of the cornea is mitigated, as water and the cornea have about the same refractive index (source: lasikmd). Hence vision is blurred for humans under water, because images are focused far behind the retina, resulting in hyperopia. Frogs have another way of correcting their retinal image. They focus on objects at different distances by using specialized (lentis) muscles to move the lens closer to or farther from the retina (Fig. 2), like the focusing mechanism of a camera (Douglas et al., 1985). However, the lentis muscles can adjust the focus only for approximately 10 diopters worth, with an accompanying shift in lens position of about 150 μm. Hence, because of the huge effect that water has on the corneal refraction (~40 diopters), a frog's lens cannot sufficiently correct the refractive state of the eye to achieve normal vision (emmetropia) both above and below water. Apparently it settled evolutionary spoken somewhere in the middle, namely myopic on land, and hyperopic under water. Not the answer you're looking for? Browse other questions tagged physiology vision eyes anatomy sensation or ask your own question. Why does squinting allow you to see objects more clearly? How do animals handle light refraction in different media? How far can birds see? Can a color-blind person see color with filter glasses? Can human eys/the brain be trained to see with bidirectional monocular vision?